Launcher Oreo 8.1 is an enhanced Android™ O Oreo™ style launcher, with many useful enhanced launcher features; just try this cool, modern FREE launcher! Launcher Oreo 8.1 intent to let users taste latest Android O Oreo(Android 8.1) launcher features without upgrade, feel like you are using Android O Oreo. 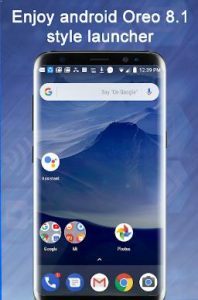 FIRST and BEST Android O style launcher in play store with simple and customization, mind blowing launcher, get and try it you will love it! Vertical drawer with recent apps. Oreo is a registered trademark of Nabisco, Inc. Very good Oreo launcher 🙂 love it. Use it with Pixelful icon pack and makes my Xperia Z3 looks beautiful. Thank you for the hard work, guys. It’s good but has no support for icon theme packs. Make it happen to get 5 stars. This app is amazing! It makes my phone look so much different with the multiple choices of settings!